Patrick Leonard is a registered patent agent focusing on the preparation and prosecution of patent applications relating to vehicle systems. 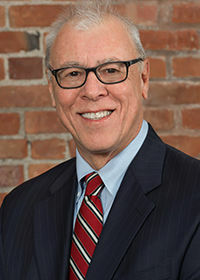 Prior to joining Bejin Bieneman, Patrick worked for a metro-Detroit law firm as a patent agent, where he prosecuted patents for internet software, vehicle systems and lasers. Patrick has over 30 years of experience in design and development of sensors and systems for medical imaging applications, including computed tomography, digital radiography, ultrasound and endoscopic surgery. He also has experience with military systems, including sensors and processors for autonomous vehicle navigation and munitions terminal guidance. In addition, he has worked on industrial applications, such as machine vision systems for semiconductor manufacturing, robot guidance and laser micromachining. After he was given the responsibility of managing his former company’s intellectual property demands, he became a registered patent agent. Patrick is a graduate of University of Michigan College of Engineering (M.S., Computer Engineering, 1982 and B.S., Computer Science, 1978).